Brunello Cucinelli single-breasted blazer in crushed velvet. Notched collar with monili underneath. One-button front. Long sleeves; button cuffs. Self-tie grosgrain belt. Side flap pockets. Tailored fit. Double-vented back. Cotton/viscose/spandex. Lining, polyester. Made in Italy. Model's measurements: Height 5'11"/180cm, bust 33"/84cm, waist 24.5"/62cm, hips 34"/86cm, dress size US 2. 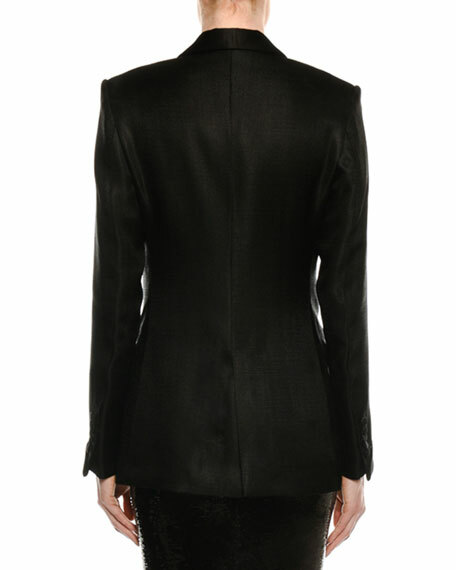 Brunello Cucinelli velvet blazer with cutaway hem. Approx. 28"L down center back. Peak lapels; one-button front. Long sleeves; button cuffs.